This entry was posted in about:memory, AdBlock Plus, Firefox, Memory consumption, MemShrink. Bookmark the permalink. I thought everyone switched to uBlock Origin. Should this have a significant effect for users with many unrestored tabs? IIRC unrestored tabs are about:blank documents until they are restored, so yes this will reduce the memory taken by these tabs by the ~90 KiB needed for the user agent style sheets. Alright. If I’m doing my math correctly, a hundred unrestored tabs would translate to a little over 9 MB. Do you have any benchmarks on how this affects actual perceived performance, such as load and render time? I measured how long it takes to build the rule cascade for the agent-level sheets (i.e. all of the built-in UA style sheets), and that’s about 0.3ms on my 2012 2.6 GHz i7 rMBP. For the user-level sheets, which is where the ABP sheet is, it’s about 13ms. So these are the times we’ll save on each page load. This is good but do not use Adblock Plus. Use µBlock. Adblock Plus let’s through some ‘kosher’ ads. If that’s acceptable to you, all good. If you want no ads whatsoever, use µBlock. It works out of the box and blocks everything. Uses even less resources that any other alternative. The ABP “non-intrusive advertising” option can be unchecked, so that’s not such a big advantage for uBlock Origin; what is a big advantage is the ability to override exceptions with $important, block inline scripts with $inline-script, read popular HOSTS files as if they were ABP lists, and override all ABP-style blocking rules with host-based dynamic filtering rules. It also does run more efficiently than ABP; it should stay that way even after this patch, but not by quite so much, because Raymond Hill has said that uBlock Origin wasn’t affected by this browser bug to begin with. Hi, This are great news but I was wondering when are you going to takle the performance problem that we are facing for quite some time in Linux, specially those use graphics cards such as ATI and NVIDIA? If you enable these, you might be pleasantly surprised w/ the results. Depending on the crappiness of your driver you might have to force-enable acceleration too which might cause instability (sure does on my ATI card). But I’ll take occasional tab crashing, esp w/ webgl, for the speedup. There’s some discussion there and links to relevant bugs. What is an MiB? Is that supposed to represent megabyte? MiB means ‘mebibyte’ (1024 KiB), used for binary measurement, whereas ‘megabyte’ (1000 kB) is MB, used for decimal measurement. As for why to use it – because it’s unambiguous. Although many Linux distributions, and I believe OSX as well are now using kB, MB etc. correctly to mean 1k, 1M bytes, Windows still uses kB and MB to mean powers of 1024. Personally I wouldn’t mind if we just used the metric prefixes for everything, so long as they *always* mean powers of 1024 when it comes to storage units – but unfortunately kb, Mb (kilobits, megabits) traditionally refer to powers of 1000, so it wouldn’t work. More effort really needs to be spent on making more extensions compatible with e10s (or vice versa), especially FireIE. I’ve seen variations on this comment many times in discussions of this post. It’s totally wrong-headed. 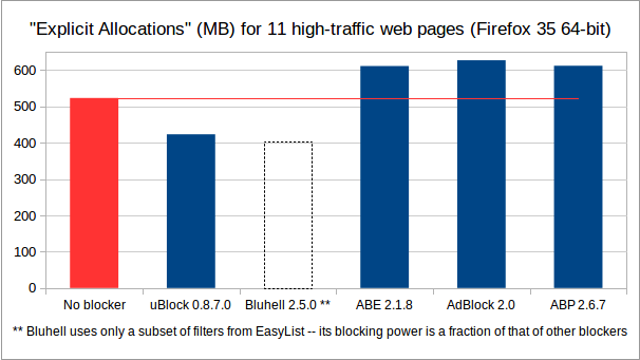 There are ~70x as many AdBlock Plus users as there are uBlock users. Unless you personally convince all 20 million AdBlock Plus users to convert to uBlock, they won’t see any benefit. (And good luck explaining to them the uBlock vs. uBlock Origin split! What a mess that is.) Meanwhile, when Firefox 41 comes out in September, all 20 million of those AdBlock Plus users will immediately benefit, without having to lift a finger, thanks to Cameron’s patch. Sometimes it’s worth thinking outside the tech elite bubble (the one where “everybody knows uBlock is better”) and thinking about ordinary users in the real world (where most people haven’t even heard of uBlock). I mainly thought it was wrong-headed because this fix dealt with a general memory issue that ABP just happened to be unusually strongly affected by, rather than something specific to ABP; however, I was sure that by now nearly everyone who used any sort of ad-blocker would have heard of uBlock Origin (while just not caring enough to switch), and I thought I was late to the party when I heard about it back in October and its earliest predecessor, HTTP Switchboard, had already been around for a few months. Ublock Origin is still much better than Adblock Plus in every way. – This patch won’t help the higher CPU usage of Adblock Plus. So Ublock Origin has not only lower memory usage, but it has lower CPU usage too than Adblock Plus! And don’t forget the resource usage difference in Google Chrome. – Ublock is the only existing full featured adblocker on Android. It has the same features on mobile as on desktop. But if we’re talking about Adblock, you have to realize that it’s Android version is a limited, dumbed down addon. You can’t even use custom filters in Adblock on Android! And not to mention the policy of Adblock with the “acceptable ads”. Nobody should support that mentality.